[BEAVER, W.Va.] Interested in learning how to take great photos with your digital camera? 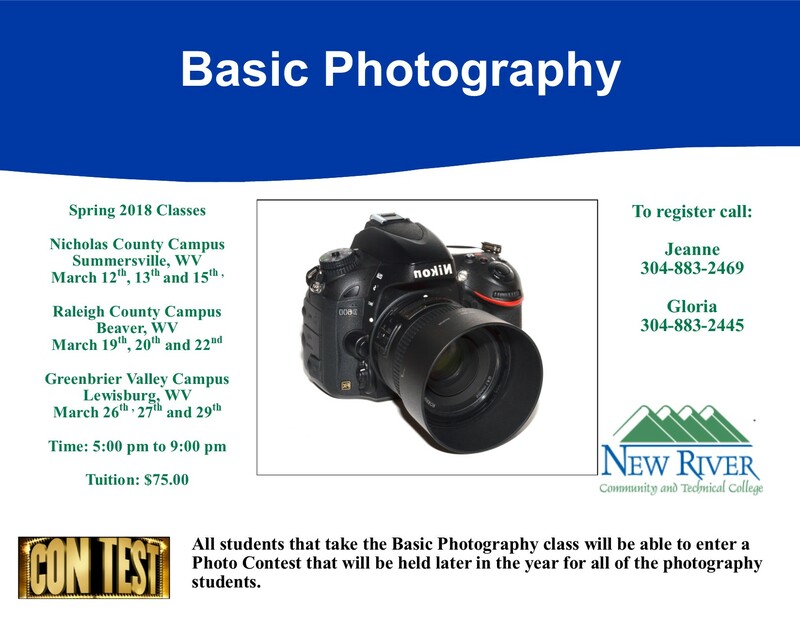 New River Community and Technical College is offering basic digital photography classes in Summersville, Beaver and Lewisburg in March. Students will learn about digital camera functions, composition and lighting and have the opportunity to enter a photography contest. The basic digital photography classes will be held from 5 to 9 p.m. at the Nicholas County Campus in Summersville on March 12, 13 and 15; the Raleigh County Campus in Beaver on March 19, 20and 22; and the Greenbrier Valley Campus in Lewisburg on March 26, 27 and 29. Pre-registration is required by March 8 for the class in Summersville, by March 15 for the class in Beaver and by March 22 for the class in Lewisburg. The cost for the class is $75.00. Classes on Adobe Photoshop are scheduled for April in Summersville, Beaver and Lewisburg.